Okay, so it's time! I would be lying if I said I wasn't nervous about revealing this new line that I've been working on for the past little while. It's an excited kind of nervous feeling, just like when I first opened up my shop on Etsy. I'm bursting at the seam over here and just have to show you. I have a little more tweaking to do to the final product before they are listed, which will hopefully be within the next week or so. I mentioned a little while ago that this new line combined my two loves in regards to crafting, and it's so very true. I absolutely love fabric and I absolutely love paper. I've always loved working with paper, the texture, the sound of it being crumpled to the sound it makes when you're sorting through a stack, and so it only makes sense that I am combining the two to make a product for my little shop. The paper used to make the cards has been handmade by myself, using 100% post consumer waste such as computer paper. I can't tell you how excited I am to be doing my part for the environment! 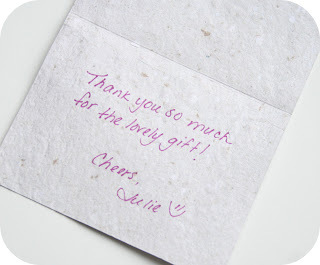 We always recycle, but to be able to reuse the paper in such a fabulous way is such an amazing feeling! Each card in this particular set has been adorned with a 1.5" thick piece of Joel Dewberry cotton which has been adhered to the paper and topstitched into place. 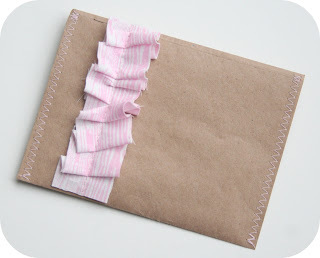 Kraft paper has been used to make the coordinating envelope, and it has been adorned with a 1 1/4" ruffle in the same Joel Dewberry cotton fabric. 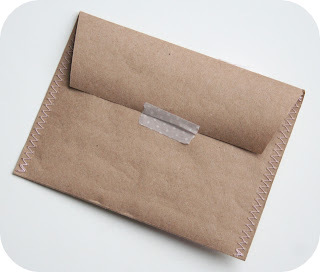 A small zig zag stitched seals the edges of the envelope and a piece of washi tape is included to close the flap (you could also use a bit of glue if you wish since there is no self-adhesive on the envelope flap...the washi tape will be longer than the one pictured on the envelope below, see the very first pic for actual length). 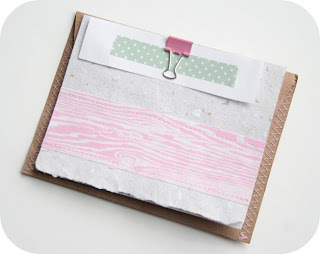 Sets will include a card, envelope and strip of washi tape. There are many more designs to come and many variations of each design to suit all tastes. 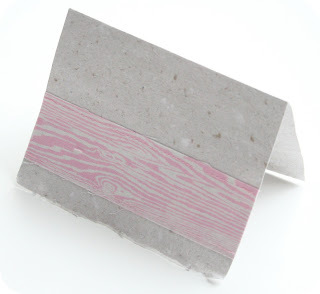 Since each piece of paper is individually made by hand, there will be slight variation in thickness and texture making each one so very unique! So that's the new line....I hope you love it! Phew, that wasn't that hard! Thank you very much! I'm happy to hear you like it!!! Thanks Jo-An! I am excited to show a few more designs, just need the time to make the paper! Very nice I loce recycled items made into new! Thank you! It's very gratifying to know that I'm doing my part! I love the envolope! So cute! Especially the zig zag stitched seals! Good job. Oh I'm thrilled you like the stitching! Thank you for taking the time to comment! I'm so happy to hear that! 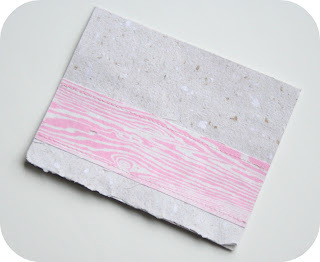 I am excited that I can reuse our scrap paper and scrap fabric as well! Thank you!